Our aim for the next stage of this year’s cruising was to relax a bit. We had pretty much rushed down the Grand Gabarit, travelling the commercial route and using big commercial locks. 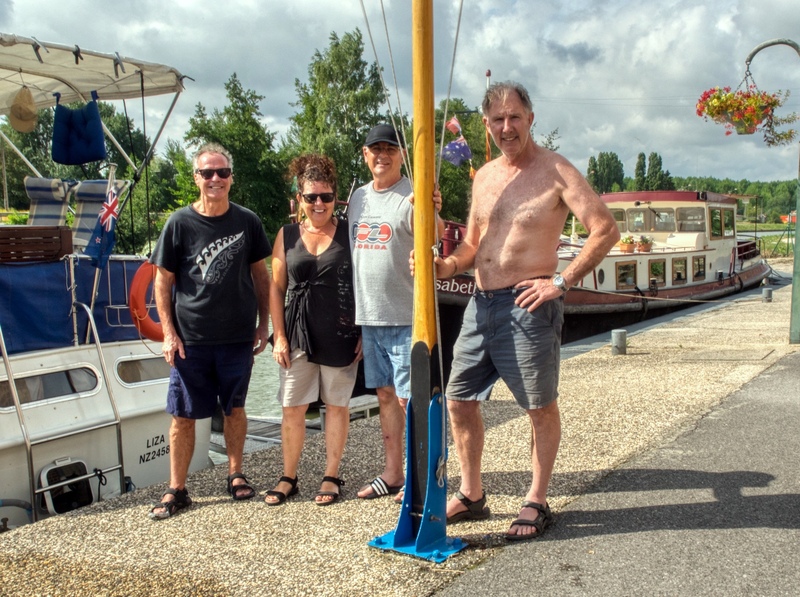 This had been a 260 km cruise over only seven cruising days – plus a few days in Béthune. The shortest route for us to our next main attraction was to travel down the River Oise to Compiègne. 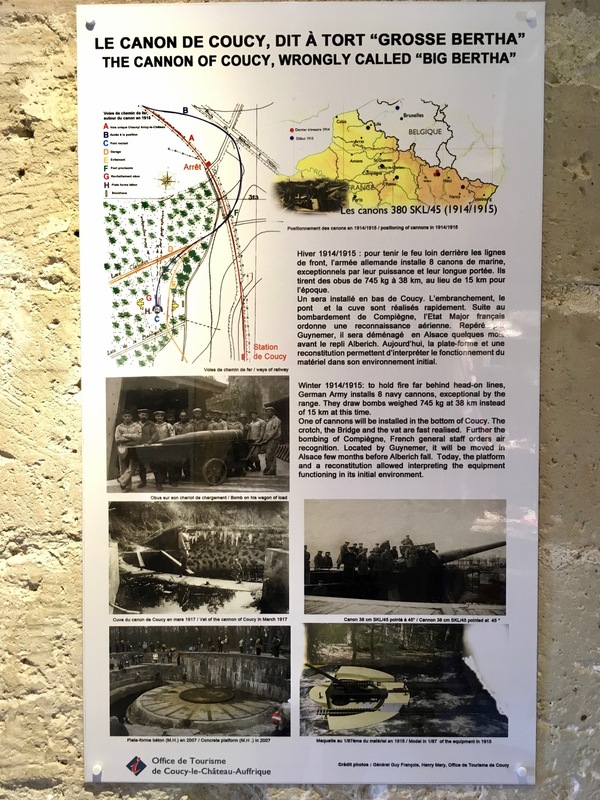 Instead, we had planned a westward deviation along the Canal de l’Oise á l’Aisne towards (but not reaching) Reims and then back eastwards on the Canal latéral à l’Aisne and the River Aisne until we reached Compiègne, a 145 km detour from the 22 km direct route. We planned to take about two weeks on this section. – including our intended track and the short cut we avoided. Apart from the gentler pace, this would also be the only opportunity this season to travel on quieter waterways with smaller locks. 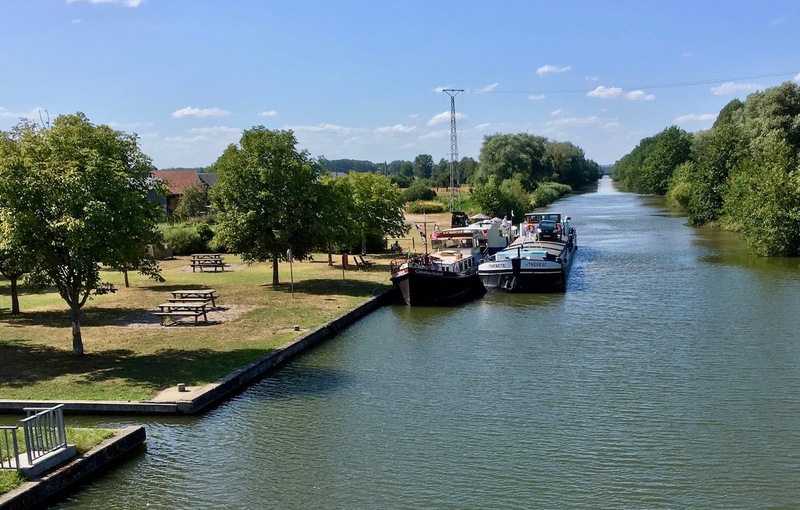 Liza set off from Pont L’Évêque about an hour before us, so we would not have to share the next few locks. Meanwhile, Lisette contacted the capitainerie at Chauny to see if there was room for both Liza and Catherina to stay that night. 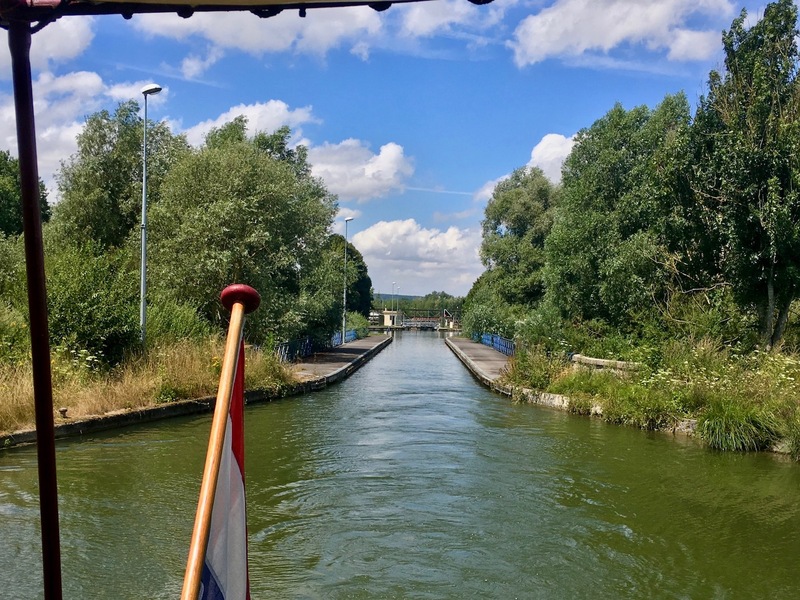 We turned into the Canal Latéral à l’Oise and headed upstream to the first lock which was only a few hundred metres along the canal. After a bit of confusion, while we tried to work out how to get someone to start the lock cycle for us, we realised it was an automatic lock. Apparently, we didn’t read ahead and plan this stretch very well. But once we paid attention to the big structure beside us, which held the telecommanders, (duh!) we were off. Simple remote. 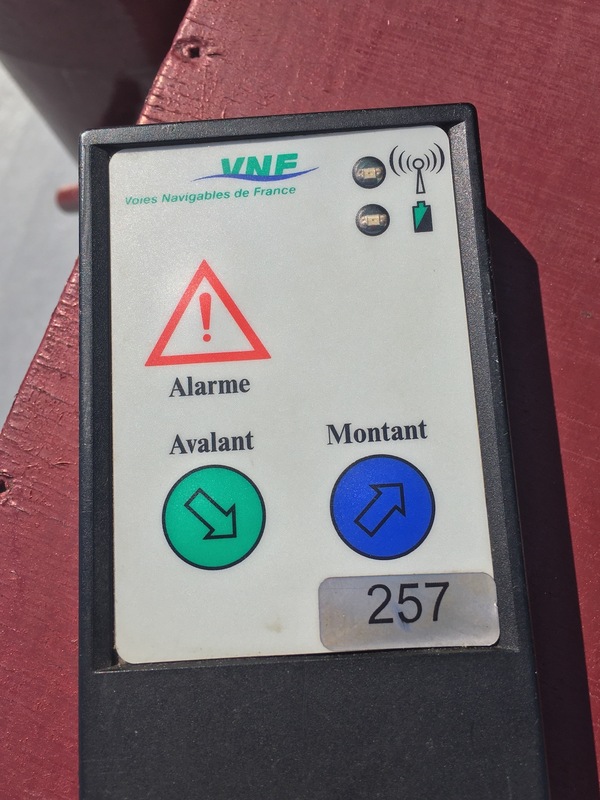 Press the blue if you want to use the écluse going upwards. It changes the water level if needed, then opens the lock gates. Once inside, you use levers mounted against the wall to initiate the locking cycle. 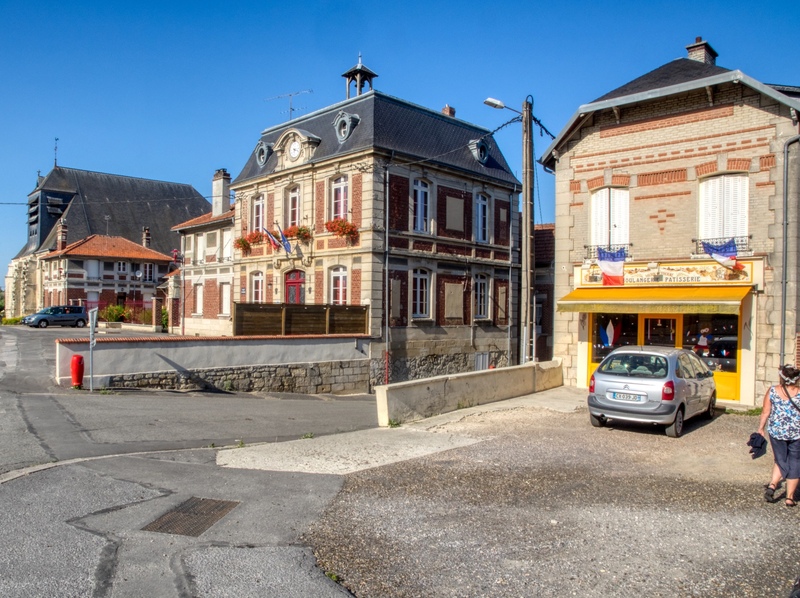 The countryside was rural with occasional houses and some VNF working areas but we were soon in the port of the town of Chauny. Derelict boats are something of a sad feature of waterways. Well set up for cruisers, Chauny has fewer moorings for bigger boats but as we had called ahead, a spot was waiting for Catharina Elisabeth. 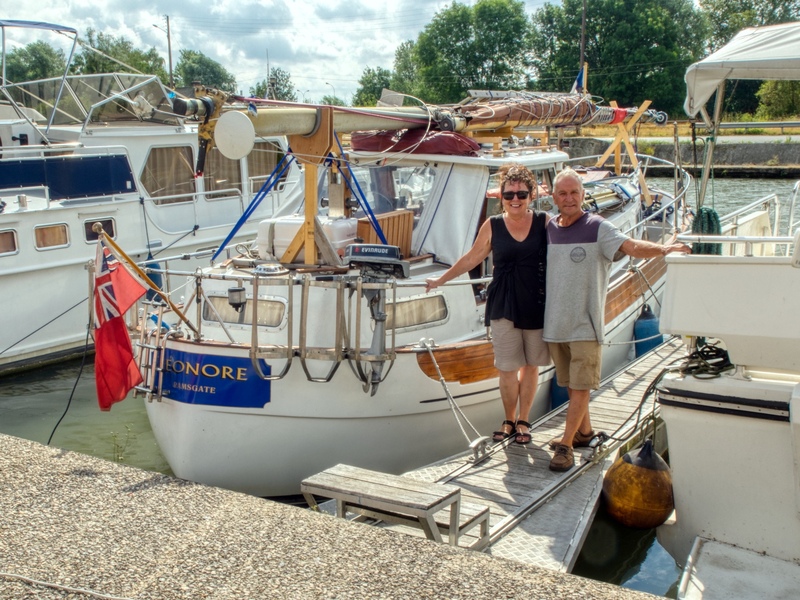 Just a little further along the quay, Liza was settled in and, to our delight, just nearby, Leonore was also moored. 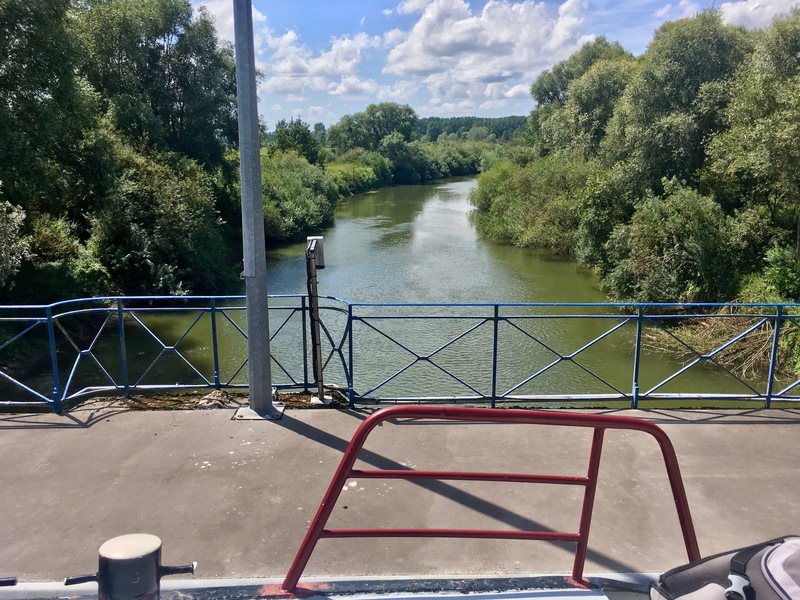 It was a blazing hot day, very high 30’s, so arrangements were made amongst a number of the boats moored in the port to gather and have a bit of a party later that afternoon – where else but on Liza! We were engaged in some chores when a large Dutch-flagged barge came up and we hailed them over to moor against Catharina. The chap was tanned almost to black and wore nothing but a skimpy set of speedos. Probably in his 70’s he was no Adonis, but clearly comfortable with his body. Anyhow, we had just topped off our water and offered him our hose to save him rolling his out. He happily went about filling his tanks. A bit later, he came over and had a bit of a conversation about the water or the hose – not sure which because his English was as good as our Dutch. We all nodded and off he went. A little later, Lisette heard a creaking inside Catharina. 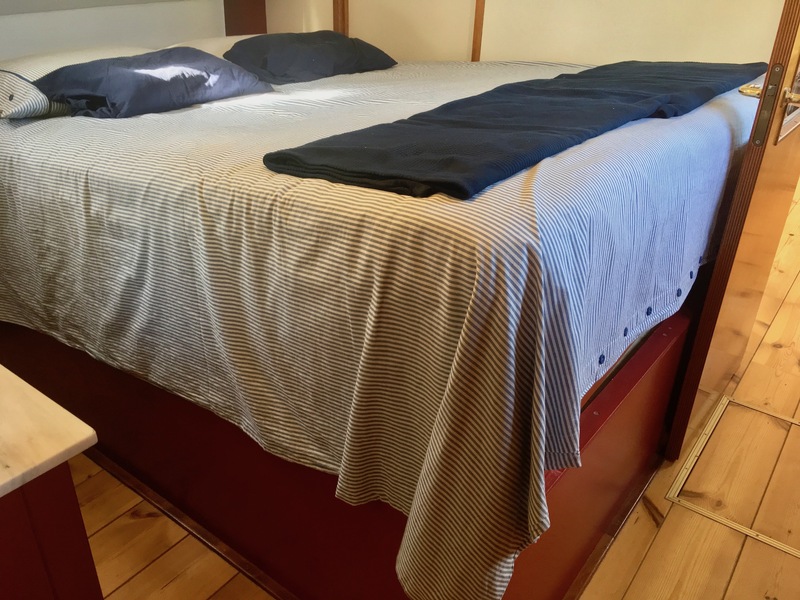 She went down to explore and was confronted by our bed reaching for the ceiling as our water tank (a plastic bag under the bed) had expanded fit to burst, and was bulging out of its frame. Contemplating the consequences of over 2000 L of water exploding into Catharina, Lisette mentioned to Ian that there was a bit of a problem and would he mind checking why the tank was overfull. Perhaps it was more along the lines of “Not again! Check the water now!” Leaping across the deck, Ian could see that the Dutch chap had replaced our hose into our tank fill port, but had not bothered to turn off the tap on shore!!! As we had just filled the tank before he borrowed the hose, any additional water being taken on board would be surplus to needs. Quickly the hose was removed and all the taps inside turned on to use up the excess water before a seam split turned Catharina into an indoor swimming pool. Not happy about having to throw water away, particularly when we had paid to stay here. All was well soon after and the bit of excitement added to the anticipation of the gathering on Liza. We were all soon enjoying tales and gossip, about ten of us, along with Craig and Gwynn (Liza), Duncan from Leonore and a Welsh couple we had all just met. However, we could see the weather was beginning to break and before long, a heavy thunderstorm arrived and the skies opened. Wind howling like a banshee, driving horizontal rain, bright flashes of lightning and crashing thunder. Those of us who had not secured and closed everything had to dash back to our boats to protect them from the elements. Lisette is keen to point out here, that she had closed all windows and battened down all hatches before leaving for Liza because the storm was on its way. Ian may be less keen to point out that he had helpfully opened everything up again just before we trotted off to Liza, to ‘let some fresh air in’. (And a fair amount of water too, as it turned out.) He hadn’t bothered Lisette with this little detail. Probably hoping she would be suitably impressed with his foresight when she returned to a cool boat later on. Somewhat drenched, but still in good spirits, Ian rejoined us where we had all retired below decks to Liza’s salon and we all kept the party going a while longer. But it was a powerful storm and, indeed during the winds that continued, Liza’s bimini was torn down, and the wheelhouse roof from another nearby barge was lifted off completely and dragged across the roof of the port captain’s boat much to his chagrin. By the next morning, the weather was cooler if a little humid. As we only had a short cruise to our next stop, before we cast off we decided to walk into the main part of the town for a bit of a shop and a gander. It is quite a pretty town but the church wasn’t open so we couldn’t go inside. Several monkeys hard at work keeping the garden tended. 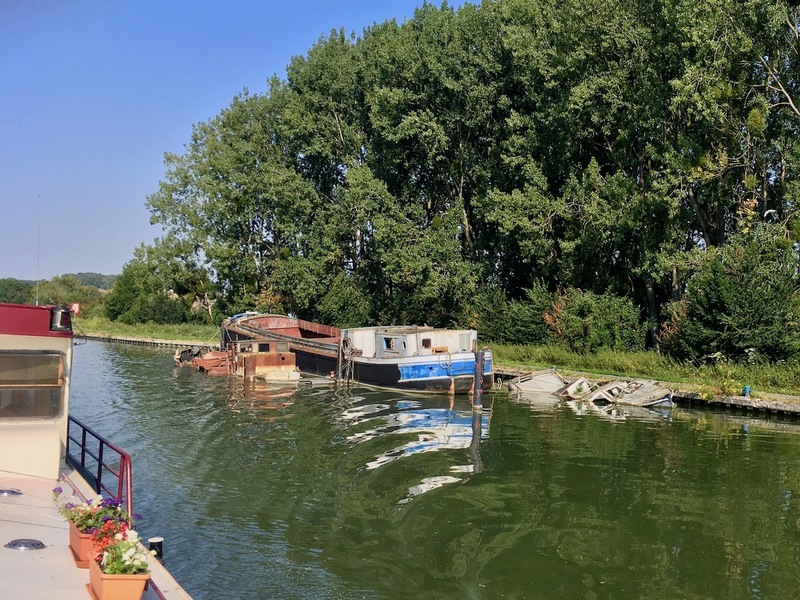 we headed off back along the canal for a kilometre or so to where the Canal de l’Oise à l’Aisne joins the L’Oise and headed for the L’Aisne (all in the name!). There is a lock immediately around the corner and, armed with our telecommander, Lisette hoped this would be a cinch to pass through. But what we found, (and we had read this in the maps we were using), was that the bollards in the lock wall are buried deep and few and far between. In addition to the paucity of pins, the pole that initiates the lock fill/empty, was often found at the far end of the lock, which would place Catharina dangerously close to the gates if we attached ourselves close enough to reach it from the foredeck. We tried a few different techniques as we navigated the locks on this stretch, but the one we ended up using the most required Lisette to get a rope onto one of the pins hidden deep in the wall. Ian would then drive forward on the rope and position Catharina close to the pole mechanism. Lisette would initiate the lock cycle, and we would reverse Catharina back to a safe distance away from the dangers of inadvertently hitting the gates. Careful timing meant this worked every time we had to do it. In one of the locks, while we tried to work out the best way to start this one, a chap came by with a dog and began a rapid conversation in French. 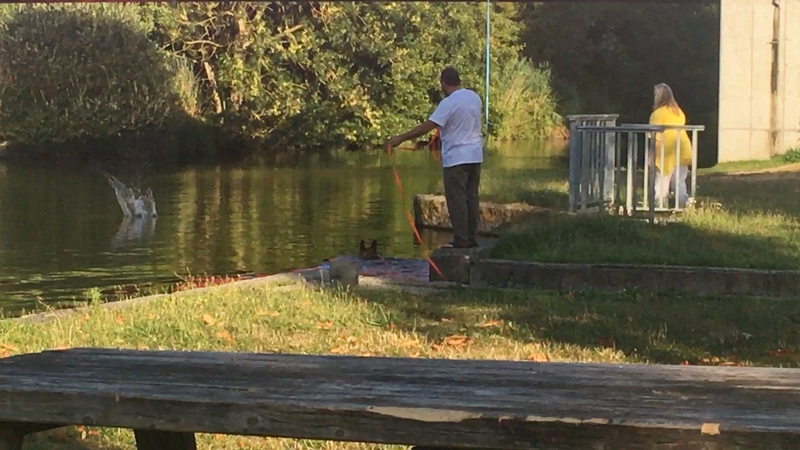 When we realised he was not there to help, but to warn us of a large log that was floating close to the exit from the lock, we gratefully navigated our way past it, and our movement helped it float to one side, where the man and his dog waited to pull it out of the water. Leaving this écluse we were pleasantly surprised to find that we had a short excursion on a small ‘pont-canal’ (canal on a bridge) that took us across the Oise. The River Oise flowing beneath us. According to our itinerary, this was the first of three pont-canals on our route. Leaving the pont-canal and écluse behind us. A couple of hours later we were moored in a very pleasant spot near the tiny village of Guny. We were sitting in the shade of the trees when a commercial peniche drew up and tied off on us and the cruiser behind us. Two of the crew (mother and son) hopped off and disappeared into the village. When they returned, baguettes in hand, they told us there was a good boulangerie in town. They had just stopped for bread. The boat was owned and operated by a Dutch couple and they were filling in time between commercial runs with a short summer holiday. With a wave of their baguettes, they cast off and departed. Centre Ville of Guny. 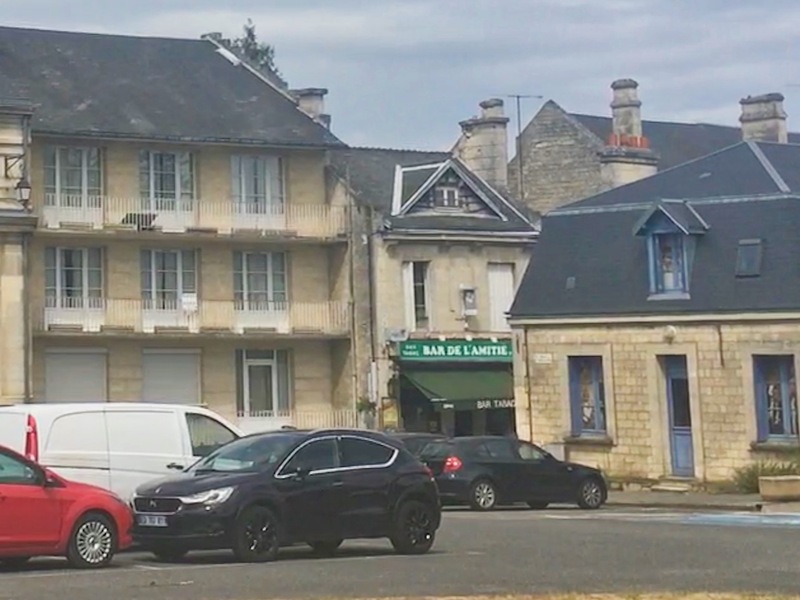 Patisserie, Mairie and the church. As the evening cooled down, and we were finishing our dinner we were entertained by a fascinating display of dog exercise as a large Alsatian-type repeatedly dove into the water swimming almost across the canal to retrieve a toy that its owners must have thrown in 20 times for his enjoyment. Lots of barking and splashing – he or she was having a great time! 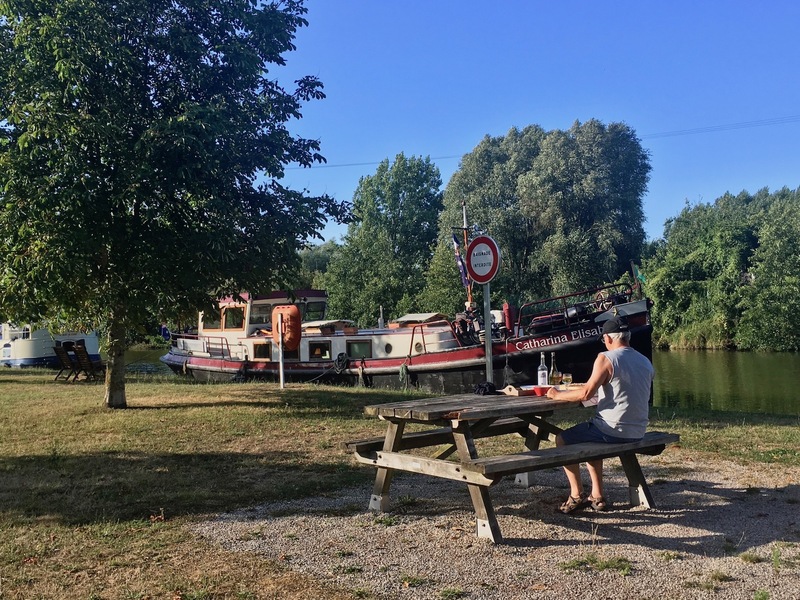 The pleasant park, seats and benches allowed us to eat dinner in a much more relaxing atmosphere than our last effort at off-board dining at Pont l’Évêque – not a whisper of any passing vehicles, let alone trains. Our target for this mooring, apart from relaxation, was the nearby Chateau le Coucy. A short 8 km bike ride brought us to a steep hill and, grateful for the batteries (Ian now attaches his battery before we set off on vertical rides), we sailed up to the town perched right at the top. As usual, we arrived just before the château was due to close for two hours for lunch. So we rode back across the main square to find a spot to wait. We soon came to the ruins of the old ramparts and sat down thinking we would use some of the time to make a quick call to the folks at home. In no time, we were having a good laugh and making final plans for them to join us in a few weeks’ time. We had chosen a spot right at the edge of a park area so that we wouldn’t bother anyone while we made the call. Not that there was anyone around, until a van drove right across the grass, stopped under the shade of a tree, and a couple got out and began to put together a picnic lunch. Several hundred metres from us. Our bikes parked where we chatted. The van was about level with where Ian took this photograph and at least 50 m from the wall itself. 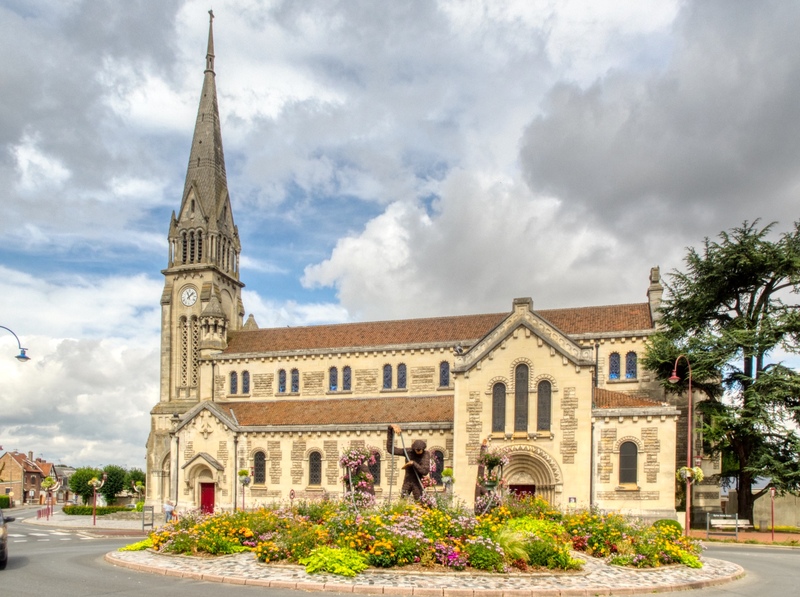 The church of Saint Sauveur in the background. After a while, the young woman walked towards us, and it became clear she was going to talk to us. We looked up with big smiles on our faces, happy to say hello. The woman stopped in front of us and simply said, in perfect English, “you have to shut up”, turned and strolled back to the van. We were flabbergasted. While it is true we were having a fine old time chatting with family, we were literally hundreds of metres from this woman, in an open public place, which we had chosen before they ever arrived. Sadly, Lisette’s first instinct was to say “of course”, but almost immediately saw red and wished to have been raised to be much less polite. Feeling very uncomfortable, and fuming, we set off to walk up and along the ruins of the ramparts. Shortly after, a drone was buzzing over our heads, which quickly returned to the couple from the van when we spotted it. Inappropriate? We thought so. Having thoroughly enjoyed exploring the ramparts and taking photographs of the amazing views across the countryside, we decided a drink was in order before the château opened up after lunch. It was still very hot. We parked our bikes outside a local tabac, where we had seen families earlier in the day, strolled in and asked for a beer, to find there were only men inside now. The appropriately named Tabac, “The Friendship Bar”. But they were happy to sell us a beer and asked us where we were from and what we were doing there. Realising we were not French, they fired questions at us hoping to learn why we were in their town. In no time, they had pulled up a couple of stools for us, and what followed was a delightful conversation in both English and French. 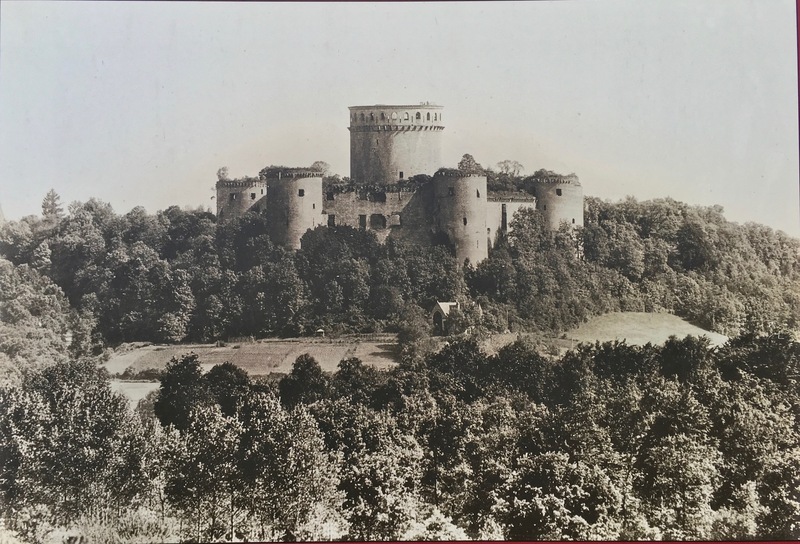 After some time one of them disappeared into a back room and came back and gifted us with a handful of old, sepia postcards showing the château and the village around the time it was destroyed by the Germans. Eventually, two o’clock came around, and we rode back to the entrance to the château. This castle was once considered one of the greatest mediaeval castles. 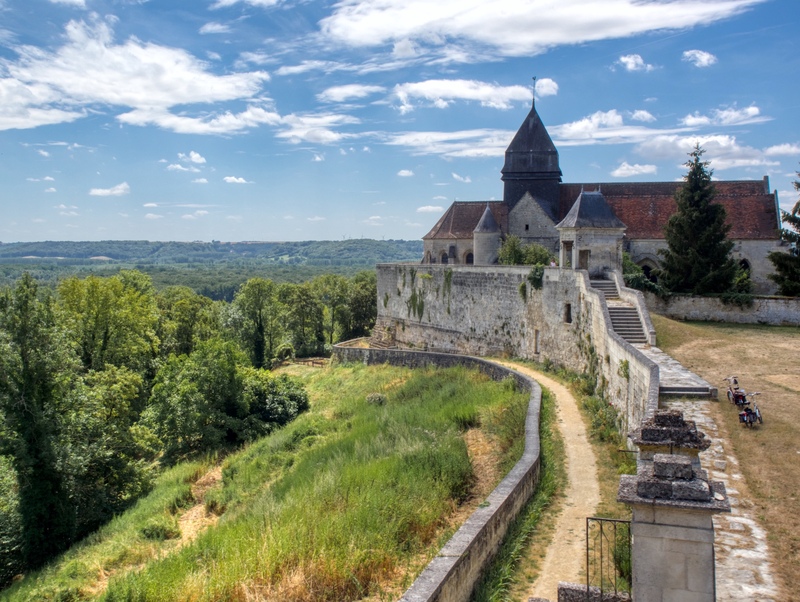 It was extensive, encompassing a village, several churches and abbeys and featured an enormous donjon, or keep, which, when constructed in the 13th Century, was the largest in Christendom (54 m tall and 31 m in diameter). The castle had fallen into disrepair when Napoleon III started restoration work in the late 19th Century but this was abandoned in favour of the nearby chateau of Pierrefonds. 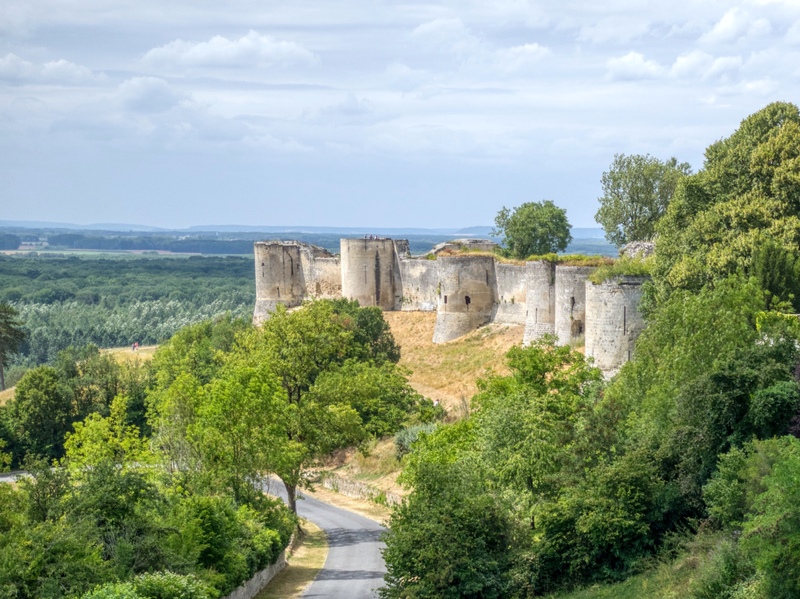 Still, the ruins were so spectacular that, before WWI, Coucy was the third most visited attraction in France (after Versailles and Mont Saint-Michel). 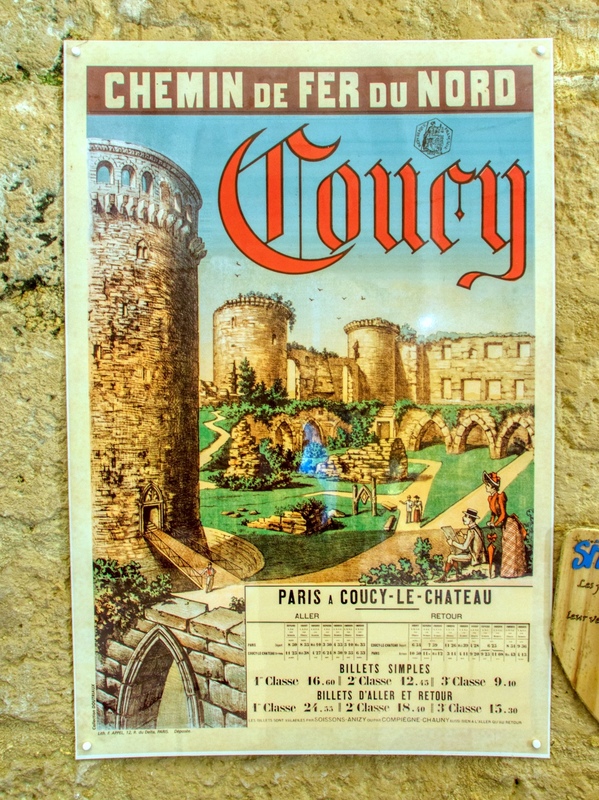 Early 20th Century poster promoting the steam train journey from Paris to Coucy. 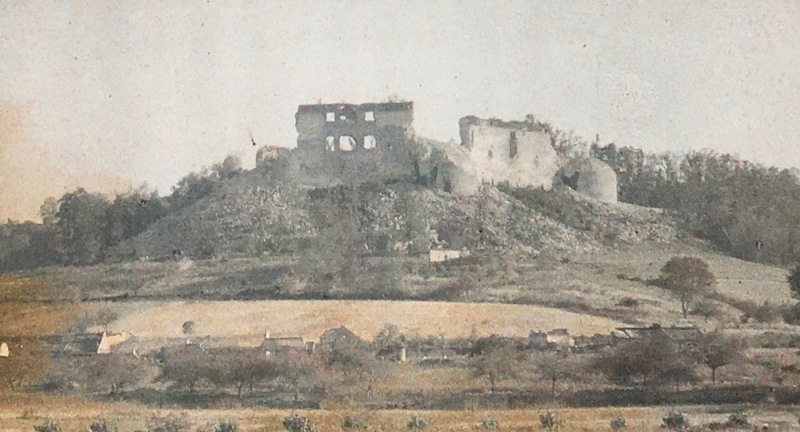 During WWI it was occupied by the Germans but as they retreated, they mined almost the entire castle and almost completely destroyed it, for no good reason, in an act that left the castle ‘a memorial to barbarity’. After the destruction inflicted by the Germans. Despite this calamity, some restoration has been undertaken and the site is replete with absolutely excellent photos, graphics and written information, almost all of it in English as well as French and German. Typical of the dozens of information stands around the château. We started in the museum which is part of the Soissons gate. Entry is free and it is run by enthusiastic volunteers – who, in our case, spoke excellent English. 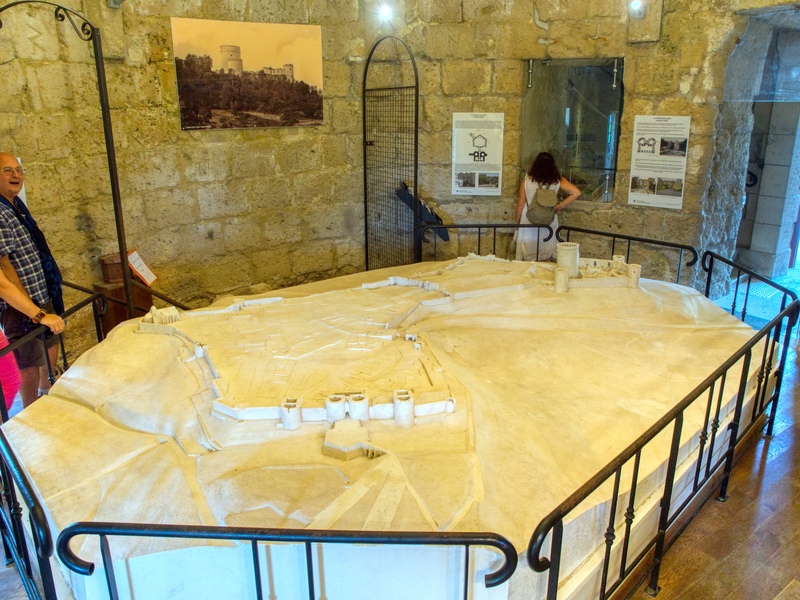 The centre of the lower floor was dominated by a maquette of the castle and walled town in its heyday. Around the walls there were numerous photos, information pieces, artefacts and reconstructions – all well explained. Model of the keep and the walls that encompassed the village (more photos in the slideshow below). Maquette of the keep in its heyday. We then moved to the main part of the castle. While it was clearly a ruin, there were places where you could gain some impression of its size and grandeur. As we walked around you could see sections where rubble had been reassembled and missing pieces reconstructed. To help gain a better appreciation of the original structure, all around the grounds there were information podiums that gave detailed descriptions of the history and function and displayed an ‘artist’s impression’ of the original form of a particular edifice overlaid on the existing view. 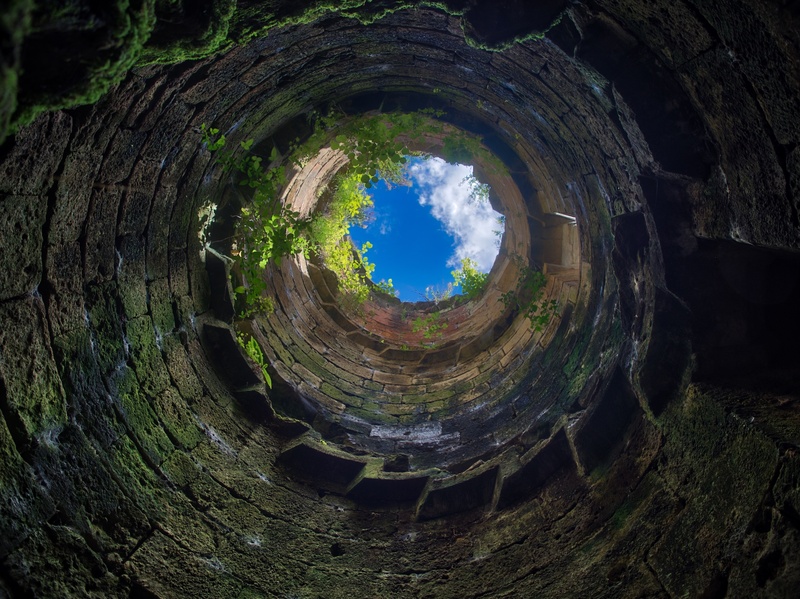 Looking up through the ruins of one of the towers from an underground hall. 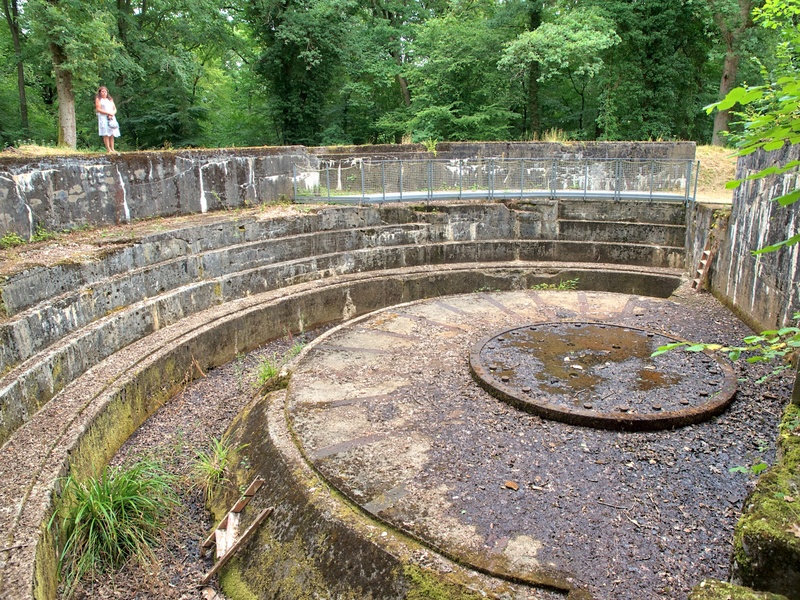 There were also quite extensive underground works that were relatively undamaged, the Germans having concentrated on destroying the above ground features, and as these areas were also cool, exploring them provided a welcome relief from the hot day above. One section was being used for a display of contemporary art, and at the far end, was a gated section where piles of the rubble were being stored and catalogued as part of the ongoing restoration works. This set of toilets had survived the dynamite. Overall this was one of the best-documented ruins we have ever visited. The historical details were exhaustive but easily accessible; the ruins were imposing and well restored; and the scenery inside and out was delightful. We spent four hours here and could have easily doubled that. this is often incorrectly attributed to the legendary ‘Big Bertha‘ type of cannon, but this was actually a modified naval gun, weighing 210 tonnes, popularly known as a Long Max. 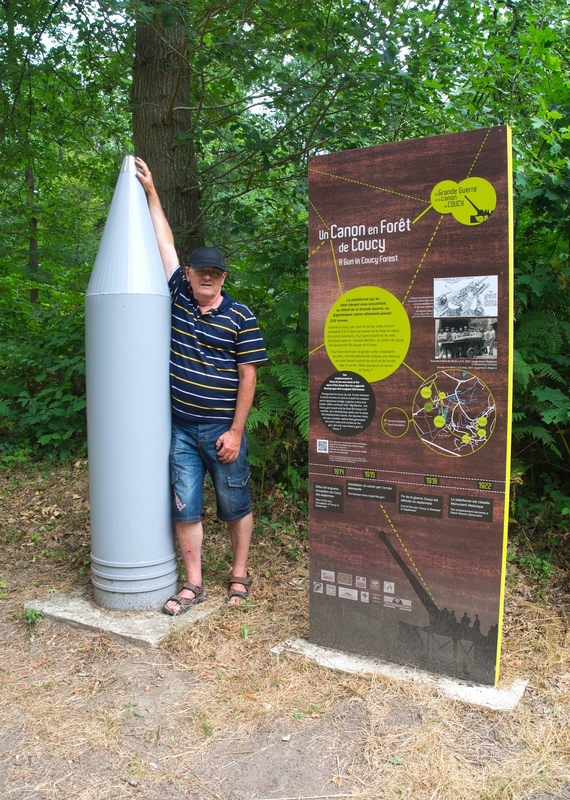 It could loft a 750 kg shell for 34 km. 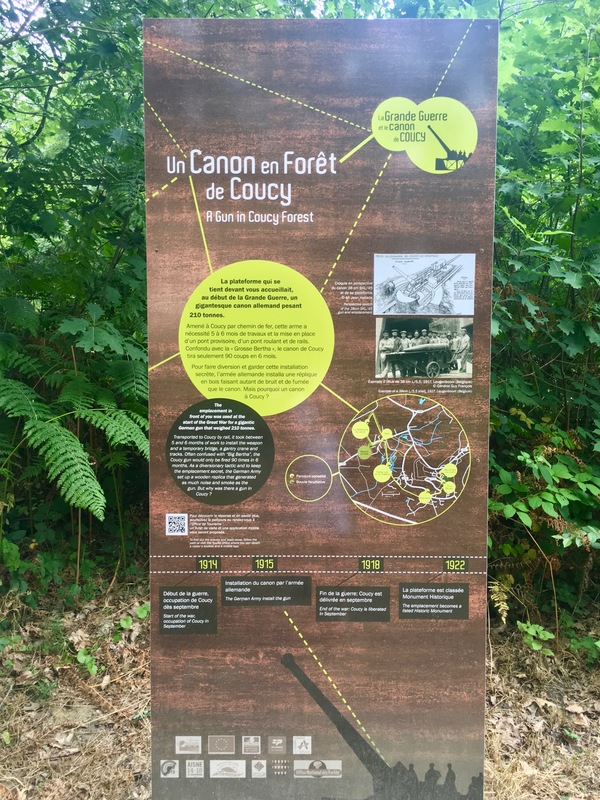 That said, the Coucy gun took over six months to install and was only able to fire 90 rounds in six months, so it was of minor strategic importance in shelling various targets on the nearby front where the Germans faced the French. You had to pay attention to notice the sign on the road directing you to the historic marker and the path was an unprepossessing lane beside a lumber yard and then a narrow, unsealed trail through the woods. However, it was an easy and quick ride to the emplacement. Sadly, but not unexpectedly, the cannon had long ago been removed and the site was somewhat neglected but it was none-the-less interesting to see the deep dugout and the arc over which the cannon would have traversed. 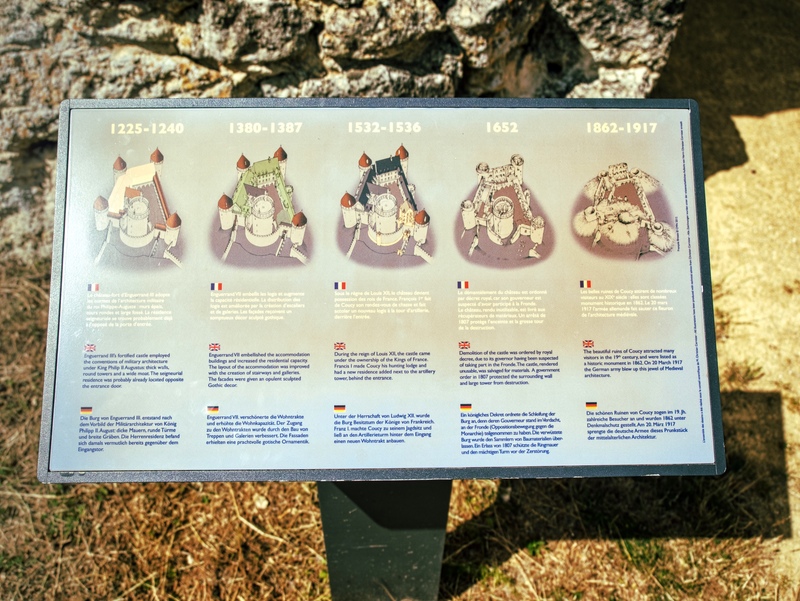 The information panels were in good condition and had both French and English descriptions. 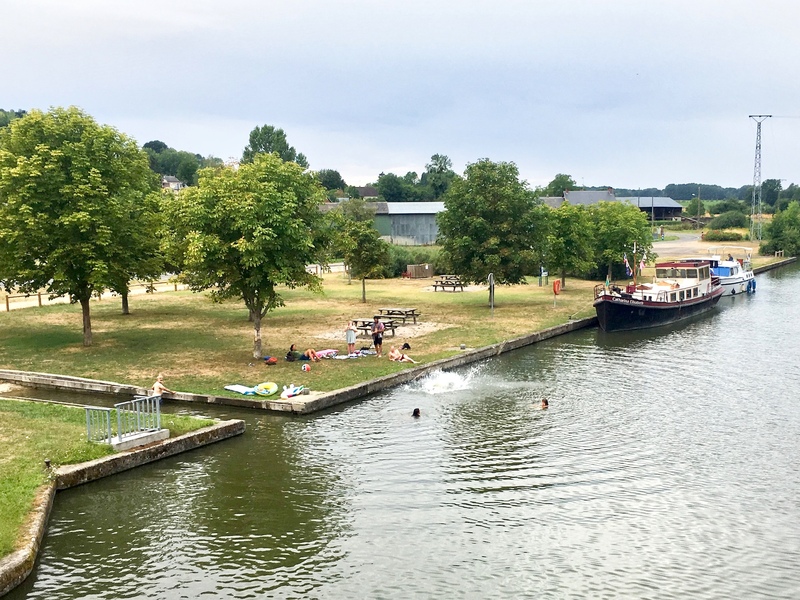 We arrived back at Catharina’s mooring after a long and very satisfying day to see locals enjoying a swim in the canal to cool off. Ian would have loved to have joined them but his leg wound was still healing and the strongly held opinion of the other half of the crew was that it would be foolish beyond description to engage in watery frolics. So, we had another very pleasant meal in the adjoining park and made plans for the next few days cruising along the canal.